In Once Upon a Time, Alex, Leah, their frog Hopkins, and host Rachel Coleman share signs for reading and story time. Plus, you'll get even more signing practice through learning modules called ABC Time and Story Time. Once Upon A Time - Beginning - Story - Together - Read - Page - Word - E - J - P - T - V - W - Book - Write - Learn - Favorite. Hi - Come - Friends - Now - Sign - Time - Teach - Singing - Dancing - Laughing - Playing - Now - Favorite - Visit - Tree - House - Everyday - Lots - Everyone - Play - Start - Today - Meet - Find - Not - Different - Share - A - B - C - D - E - F - G - H - I - J - K - L - M - N - O - P - Q - R - S - T - U - V - W - X - Y - Z - More - Count/Counting - Sheep - Night - Sleep/Asleep - Mom - Silly - City - - Room - 1 - Chair - Where - Sit - How - Why - Bump/Hurt - White - Itching - Finish - Great - Find/Pick - Author/Writer - Illustrator - The End/Finished. 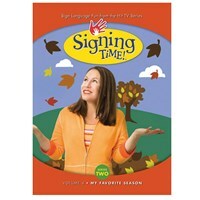 Special Features: Sign Review - ASL Tips: More Signs - ASL Tips Using Signs in Stories - Sing and Sign - Counting Sheep with Lucy Coleman - Preview: Series Two, Going Outside - Preview: Series One, Welcome to School - FAQ: Rachel's Color-Coded Fingers.